Knowing how much powder you need for a particular job is critical when determining cost. Without that information, it is easy to make pricing mistakes that can drain your profits or run off potential clients due to pricing that isn’t competitive. However, calculating powder cost can be a little confusing. 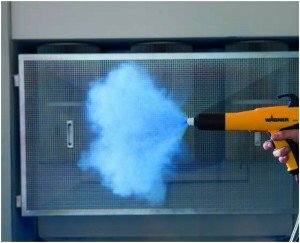 We’re going to show you how to calculate powder coating coverage and how to gather the information necessary to give an accurate prediction of cost per square foot. Powder Specific Gravity: This is usually supplied by the powder coating manufacturer on their technical data sheet. Remember that not all powders of the same color have the same specific gravity. Cost Per Pound of Powder: Check your invoice or get the cost from your powder manufacturer or sales representative. 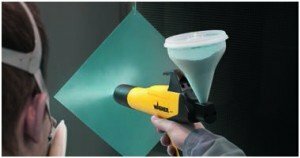 Transfer Efficiency: Transfer efficiency is the percentage of the powder that is being applied to the part instead of being wasted as overspray. Transfer efficiency is almost always an estimated figure and the most difficult one to determine when estimating coverage costs. It is hard to get an accurate percentage of how much powder is being applied to the part and how much is going in the filters, on the floor, on the rack, and getting stuck to the booth’s walls. Transfer efficiency is directly impacted by how much powder the operator is using. Transfer efficiency is directly related to the way the operator is applying the powder. 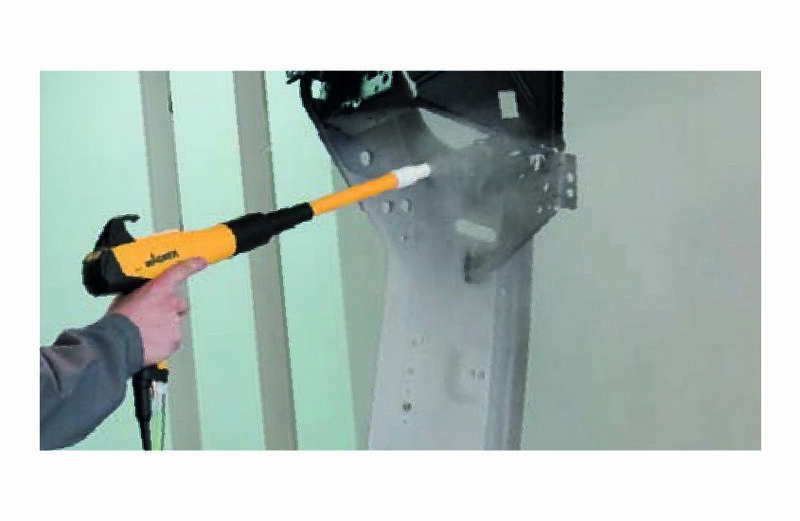 If there is a giant cloud of powder in the booth or a heavy fog of powder blasting out of the gun, you can bet that there is more wasted powder than if the operator is spraying lightly enough to coat the face of the part and still get a gentle wrap of powder moving around the part to partially coat the other side. 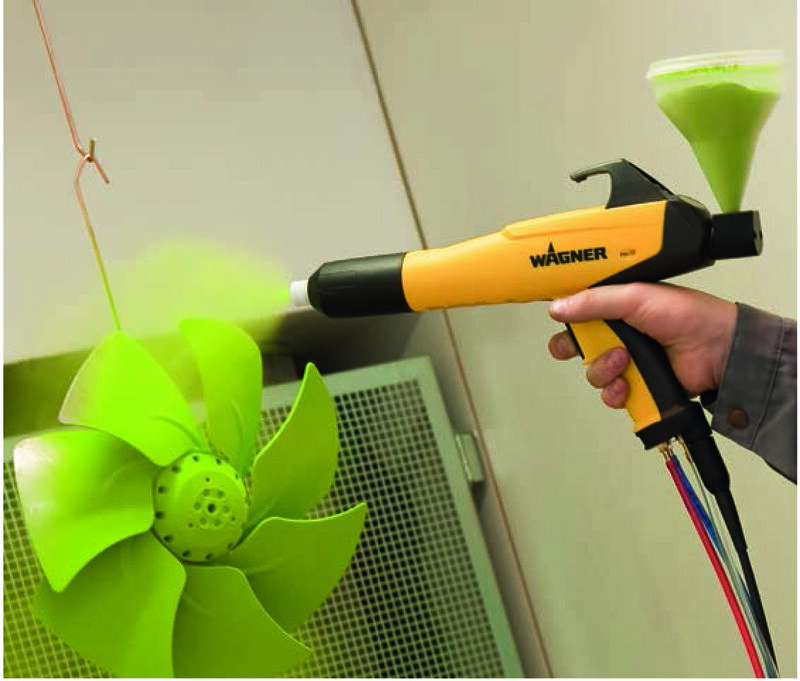 Proper ground and powder coating gun quality can have a significant effect on transfer efficiency. A shop with a dedicated ground rod that is connected to the parts rack or hooks, or to an uncoated portion of the parts, can always get better transfer than one that doesn’t. 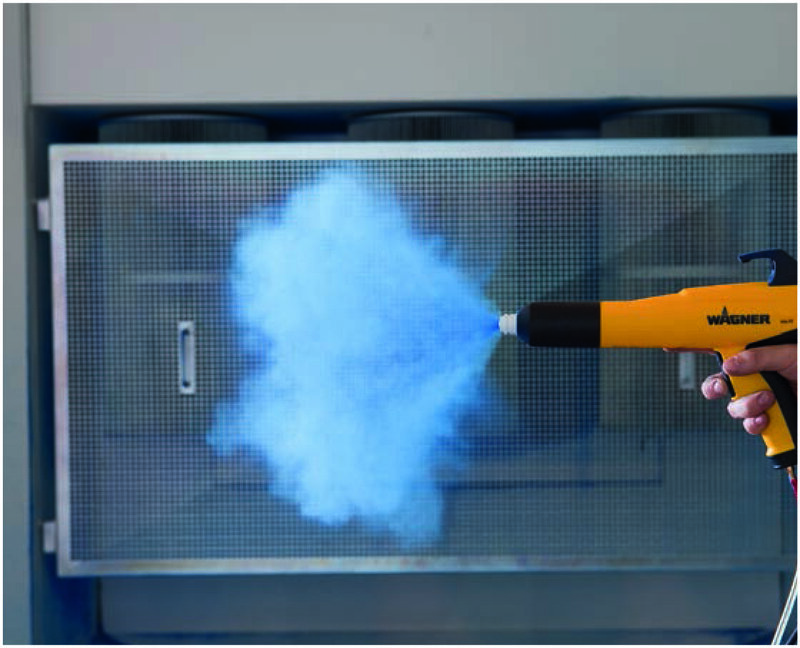 Likewise, a shop using a professional quality electrostatic gun with adjustments for powder flow, voltage and current can get better results than one using a hobby gun. For estimation purposes, if this is a new operation with untrained painters, the transfer efficiency can be as low as 25%-30%. After proper instruction, experience, gun adjustment, and proper ground, the transfer efficiency can reach 70%. If you are reclaiming the powder by collecting and reusing the powder, you could possibly reach 85%. Powder Deposited (the weight of the powder on the part) divided by Powder Applied (the weight of the powder in the bag) multiplied by 100 will give you the basic transfer efficiency percentage. Dry Film Thickness: This is the amount of powder you would like to apply to the part, measured in terms of coating thickness. You can measure a part with a DFT gauge to get an average of the mil thickness across a section of the part’s surface. You should take as many readings as possible, then average them, to get the most accurate estimate of the overall average thickness. Square Footage of Metal in Your Part: This might take a bit of calculation but it will give you the cost per part at the end of this exercise. Now that you have all the data you need, you can apply the powder coating coverage formula. Assumption: The Powder Coating Industry standard is 192.3 square feet of coverage per pound of powder. This pound of powder would be at 1.0 specific gravity and applied at a thickness of 1 mil with 100% transfer efficiency. In other words, this is how much surface a common powder could cover if no powder was wasted and you only needed a thickness of 1/1000th of an inch. Example: Powder A has a 1.5 specific gravity and is being sprayed at 2 mils with 50% transfer efficiency. The powder cost is $5.00 per pound. The part being sprayed has 3 square feet of surface area. Next, take your cost per pound and divide it by your ACR. Multiply this cost by the square footage of your part’s surface area and you’ll know the cost of the applied powder. Knowing what your cost is for powder coverage will prevent you from making costly budgeting mistakes and keep your prices competitive. 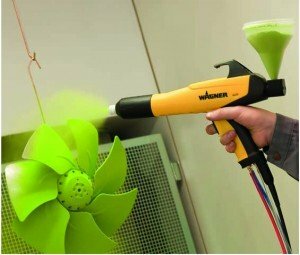 In order to maximize your profits you have to maximize your transfer efficiency, and the best transfer efficiency comes from professional powder coating guns. Professional guns provide multiple settings and factory-presets to get the right amount of powder onto your parts without excessive waste. 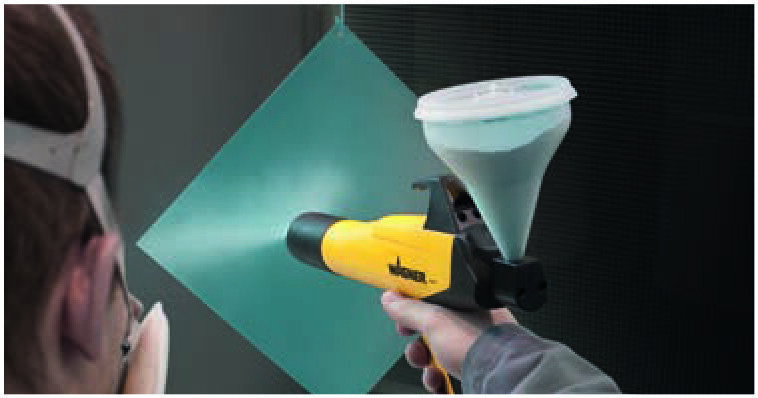 Reliant Finishing Systems only provides professional quality powder application guns from industry-leading companies like Wagner. When you buy from Reliant, you know you’ll be getting the gun you need to get the job done right. Looking for a new powder coating gun or new powder coating system? Give us a call today – our systems specialists are standing by to answer your questions and help improve your operation. This entry was posted in News on June 23, 2016 by Bruce Chirrey.